"FYI our staff absolutely loved the HR program this week! They were both excited at what and how much they both got out of it!! Just wanted to share their feedback!" The Institute for Family-Owned Business provides programs and services on issues that can benefit every member of your family and your business. Taxes and the family business and more! 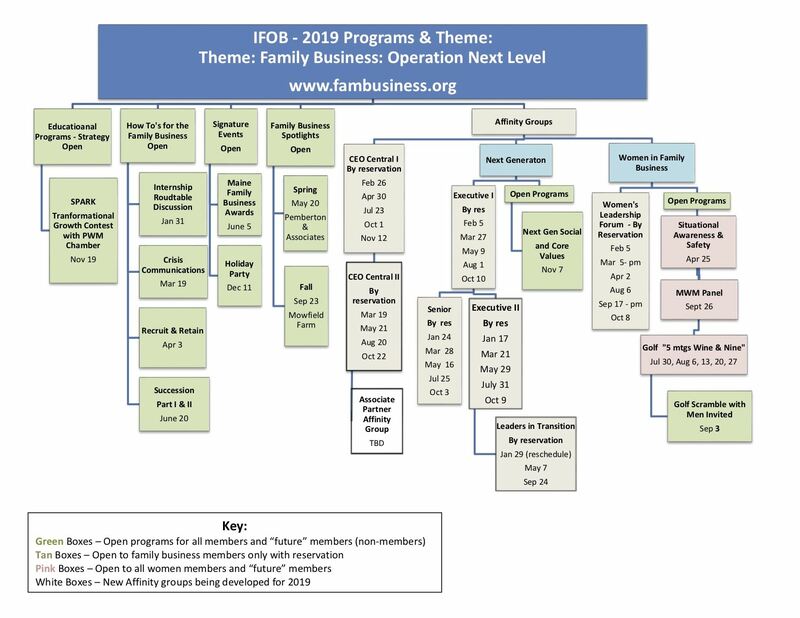 The 2019 programming theme is "Family Business: Operation Next Level". We have over 50 programs scheduled, from small facilitated meetings to open programs where we encourage all members and "future" members to join us. Our How To's for the Family Business Series is a great example of the types of programs we offer. This series consisted of three different programs - Part One: Crisis Comminication- The Wolak Group Dunkin Case Study, Part Two: Recruit, Retain & Engage Employees, and Part Three: Succession Planning- It’s All Relative: Effective Leadership and Managing Transitions in a Family Business. Click the hyperlinks to join us at one of our upcoming "how-to" programs. When discussion of particular issues at your firm would be enhanced by an objective third party, we can help you to identify an appropriate facilitator. The Institute is a comprehensive resource for family businesses. If you have a need for information, support or guidance, we can help. We can be reached at (207) 798-2667 or by email catherine@fambusiness.org. Our mailing address is Post Office Box 3364, Portland, Maine 04104.